The Activated Charcoal Clay Masque gives you a facial in a jar! As the charcoal mask dries, feel it tighten on your face and as it is pulling out the impurities and excess oil from deep within your skin while stimulating blood flow. You’ll never want to run out of this baby again! Best for oily or acne prone skin types. This mask comes in a powder form so you have the option to customize it by mixing in your favorite essential oils or liquids like witch hazel or apple cider vinegar. A little goes a long way! 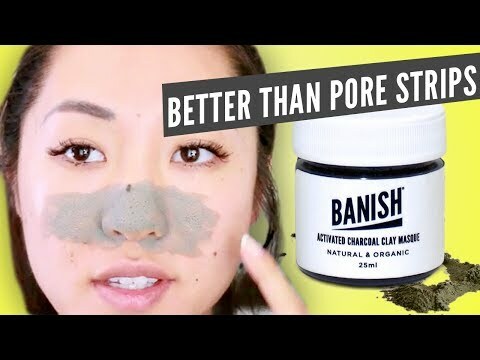 Slay blackheads and impurities with this mask for months to come! Activated charcoal acts like a magnet to absorb oils and impurities. Your skin won't reabsorb the bad stuff while the mask is on. DMAE - made from fruit acids and helps to tighten skin. Use our activated charcoal mask before our pumpkin enzyme mask for healthy radiant skin! When skin is cleared up, you can use our best selling Banish Kit to further improve the texture and appearance of your skin. After 1 week with pumpkin enzyme mask, charcoal mask, and vitamin c elixir. We're so excited that this masque was featured on Huffington Post! When your skin is cleared up, you can use our best selling Banish Kit to further improve the texture and appearance of your skin. Mix the activated charcoal clay masque with water or your favorite liquid until you make a paste. Add a layer onto your skin and let dry, then wash off. Get rid of clogged or large pores by using this masque 1-2 times a week. For external use only. This activated charcoal clay mask is so much fun to use, loved the results on the first use !!! It dries out my breakouts gives deep purification and sebum control. This dries out my breakouts instantly and evens out my skin tone over all!! I’m sooo happy to have tried this out! I love this mask! I have combintion skin but it tends to be more oily as the day goes on and this mask has helped so much to make it less oily! Also has helped in clearing up my acne! Would recommend to anyone! Love all my banish products so far!